Happy 4th! (Even to George III) - Adam Smith, Esq. With the world seemingly departing from the familiar for parts unknown almost anywhere one looks these days (the Middle East’s evidently insatiable crescendo of chaos, Brexit, the paranormal US election, even staid central bankers exploring the world of negative numbers), this Fourth of July seemed a propitious moment to take a step back from it all. Annually since 2011, the powerful and trenchant Stratfor has reprinted its monograph on “The Geopolitics of the United States,” which puts global trends in historic military, political, and strategic perspective. The Stratfor piece is actually in two parts, “The Inevitable Empire,” and “American Identity and the Threats of Tomorrow.” I will highlight a few of its insights here. One of America’s great and oft unappreciated gifts is simply its geography. The Mississippi Basin together with the Intracoastal Waterway contain more kilometers of navigable internal waterways than the rest of the world combined, and the American Midwest is the world’s most productive and largest contiguous piece of farmland. The Atlantic Coast offers more major ports than the rest of the Western Hemisphere. This matters because water transport is typically one-thirtieth the cost of land transport per ton-mile. And while the Atlantic and Pacific are universally recognized as vast insulators to America’s east and west, less well appreciated is that deserts to our south and lakes and forests to our north provide significant geographic separation from Mexico and Canada, or at least their population centers. But the United States as an entity was not a sure thing in the beginning. 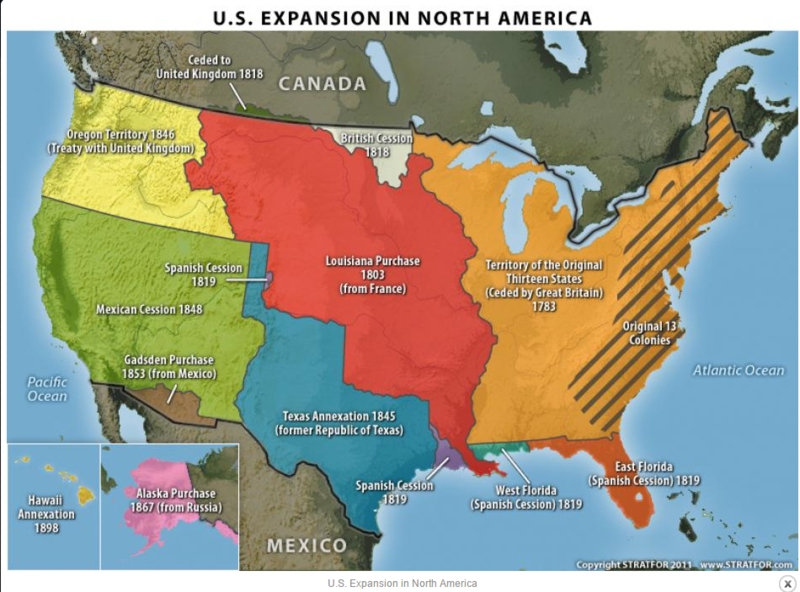 France controlled the bulk of the useful territory that in time would enable the United States to rise to power, while the Spanish empire boasted a larger and more robust economy and population in the New World than the fledgling United States. Most of the original 13 colonies were lightly populated by European standards — only Philadelphia could be considered a true city in the European sense — and were linked by only the most basic of physical infrastructure. Additionally, rivers flowed west to east across the coastal plain, tending to sequester regional identities rather than unify them. France did not even bother using its American territories to dispose of undesirable segments of its society, while Spain granted its viceroys wide latitude in how they governed imperial territories simply because it was not very important so long as the silver and gold shipments kept arriving. Still, success as an independent nation was far from assured. The early colonies’ coastal nature made them vulnerable to any serious sea power (cf. the War of 1812, when the British rather handily sacked Washington, DC). Coastal nations have only two ways to protect themselves: Counter navies with a navy of your own, but this gets expensive fast, and the early United States could barely muster a serviceable merchant marine, much less a blue-water navy that others would have to take seriously. This brings us to the second option, which the US pursued with a vengeance: Develop internal territories (primarily, for the US, the great Mississippi Basin). Second was construction of the Cumberland (a/k/a the “National”) Road, now often seen as a forgotten footnote but critical in linking the East Coast to the interior: It ran first from Baltimore to Cumberland, Maryland (navigable head of the Potomac), then west to the Ohio River Valley at Wheeling, West Virginia in 1818, to Ohio by 1828, Indiana by 1832, Illinois by 1838, and finally Jefferson City, Missouri in 1840. If you’ve traveled on Interstate 70 you have the Cumberland Road to thank for the route.